Local artist Chris Opp’s latest project includes creating new welcome signs for Bossier City that will be posted on the interstate. If there’s anyone who exemplifies the phrase “living the dream,” it’s renowned local artist Chris Opp. Born and raised in Southern California, Opp has been drawing ever since he can remember, and in 1972 he turned his art into a career when he started working in the silk screen industry. “My goal as an artist is to bring color into the world and local communities, and to make walls come to life,” Opp told the Press-Tribune. From running screen printing machines, making silk frames, type-setting, and photography, Opp moved on to printing his own t-shirts and decals out of his garage. That led to airbrushing vehicles, which prompted him to start his own business in 1975. And so Opp Art Designs was born. Originally named Opp Art Design Studio, the business was renamed Opp Art Inc. when he moved to Albuquerque, New Mexico to work on the Don Imus Ranch, where he was tasked with redesigning 21 western-style buildings to make them look old. After that, Opp came to Louisiana to do specialty finishes, graphics, and murals at the Hollywood Casino in Shreveport. Opp has received numerous awards and honors for his work, including the Bank of America Award when he was in high school, numerous newspaper and magazine articles about his work, and life-time teacher credentials in California, to name a few. Opp described his style as “old school.” He explained that he is always changing and always learning. Opp has done work for a lot of major casinos around the country, creating designs in Vegas, Shreveport, New Mexico, Pennsylvania, Florida, Biloxi and even Aruba. He has worked in over 400 Restaurants across the US, and has painted for The Beach Boys, Don Imus, Burt Reynolds, numerous rock bands, and his church. Opp said that in 2013 he prayed for 10 wall art projects, and got 16. Those included the “Bubbles” mural behind the Bossier Arts Council, The Hub: Urban Ministries, the C & C Lighting mural on Line Avenue in Shreveport, a mural for Airline High School, as well as nine interior and exterior murals at the Margaritaville Resort Casino. This year, he has completed six so far and already has eight more commissioned. 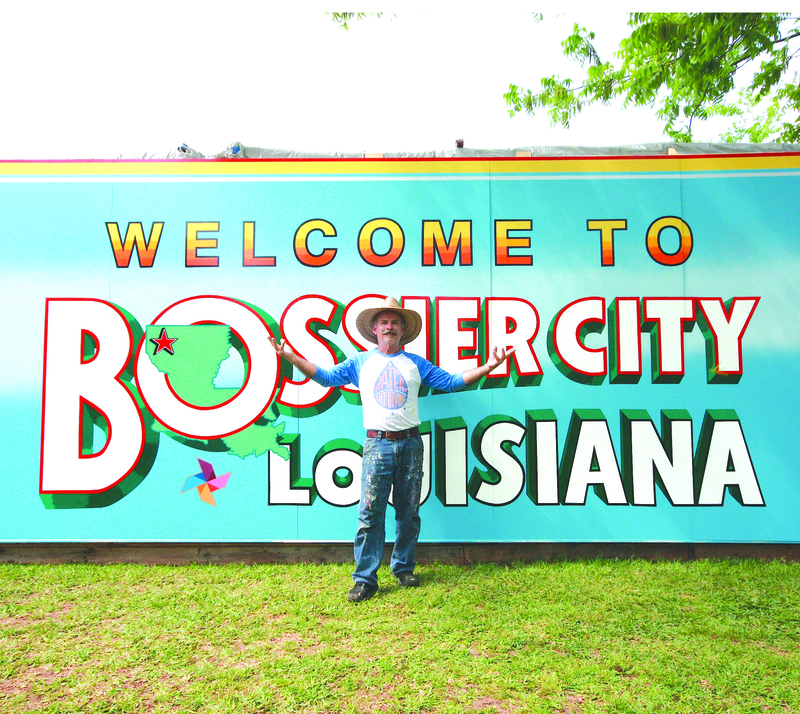 In addition, he recently completed the design for five “Welcome to Bossier City” signs for Bossier City that will be placed along the interstates. Looking ahead, Opp is excited to continue running his own business and greatly enjoys being self-employed. “I have not worked for or punched a time clock since 1975,” he said.